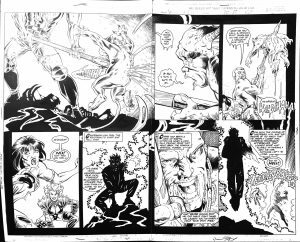 This is the original art for Vampirella Death & Destruction #1 pg 5 Amanda Conner & Jimmy Palmiotti. This is the PaperFilms dream team working together. Great for display and learning! Beautiful storytelling, wonderful inks and amazing characters. Classic artwork from the team! **NOTE: This is older artwork so the pages may be slightly curling and/or contain wear. The images represent as best as possible the artwork. There are no tears in the pages and/or ripping. The pencil and ink are still solid black. If you are unsure, please use the Contact Us to ask about the page. 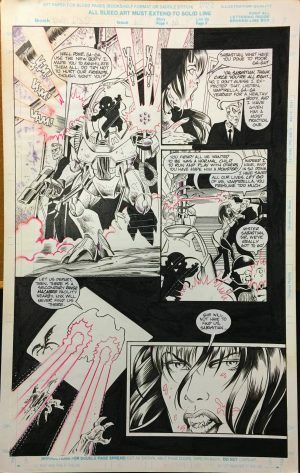 This is the original art for Vampirella Death & Destruction #1 pg 5 Amanda Conner & Jimmy Palmiotti. This is the PaperFilms dream team working together. Great for display and learning!